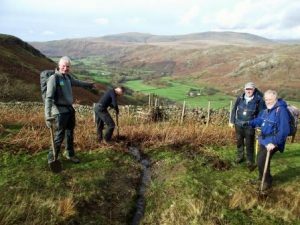 One of the Fix the Fells volunteers in the Lake District has been recognised by the National Trust in their annual, regional staff and volunteer recognition awards for people who have made an outstanding contribution to their region. 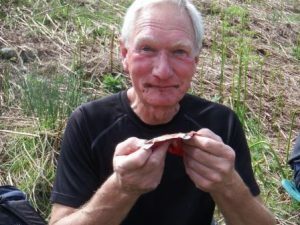 Alan Manby, who lives in Ambleside, won the NT “North Star” Award for March 2019 for his contribution to the Fix the Fells volunteer scheme. 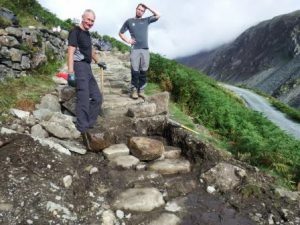 Alan is unrivalled in the amount of time and effort he puts into the work of Fix the Fells, which protects the spectacular Lake District fells from erosion damage by repairing and maintaining the upland paths and landscape. There are 150 Fix the Fells volunteers and they are referred to as “Lengthsmen”. This term comes from medieval times when Lengthsmen would be paid to walk the length of the parish and repair any roads and unblock ditches. Since joining Fix the Fells in 2014, Alan has consistently been the Lengthsmen who has contributed the most days working in the fells in all weathers every year. Alan contributed 141 days in 2018, 144 days in 2017, 122 days in 2016 and 122 days in 2015. Alan also helps to organise and run the volunteer scheme and its practical path repair and maintenance work. He is a mentor for new volunteers and repairs the tools and sheds needed for the work of the volunteers and Rangers. He helps to host visits from other organisations, local businesses and other volunteer groups interested in the work of Fix the Fells. He has contributed to numerous media and other events to promote Fix the Fells. In addition Alan works with the Lake District Foundation to raise much needed funds for Fix the Fells, by coordinating and extending the network of collecting boxes across local businesses. His love of the Lake District fells drives him to tirelessly contribute to and improve the work of Fix the Fells. The award is to acknowledge and thank Alan for his time, enthusiasm, dedication and passion for the work of Fix the Fells. Alan will receive a letter, badge, publicity for his work within NT and will also be entered into the annual NT North Star Awards. Joanne Backshall, Fix the Fells Programme Manager, said, “We are delighted that Alan has received this recognition for his fantastic work for Fix the Fells and thank him most sincerely for all he does with us. Fix the Fells works to protect the wonderful Lakeland landscape and wildlife, which is enjoyed and valued by so many people for their physical, spiritual and mental well being. Fix the Fells needs £500,000 a year to complete its upland path repair work and this comes from donations and grants. 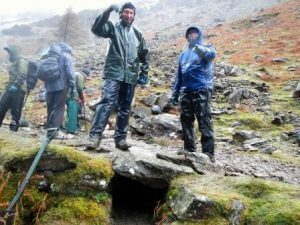 All financial support is gratefully received and more information on how to do this can be found on our website www.fixthefells.co.uk.